Alabama sophomore running back Josh Jacobs has 43 rushes for 276 yards this season and 12 receptions for 165 yards. Alabama running back Josh Jacobs hasn't lived up to his expectations as a sophomore. Fortunately for Jacobs, his season could be far from over. The 5-foot-10, 212-pounder from Tulsa, Okla., will head to Alabama's national semifinal showdown against top-ranked Clemson in the Sugar Bowl with half the productivity he attained as a freshman. Jacobs rushed for 567 yards and averaged 6.7 yards per carry last season, and he has 276 yards and a 6.4-yard clip this year. "I wouldn't say I've accomplished what I wanted to from my perspective," Jacobs said. "As a team, we've kind of done that, but not from my perspective. There is a lot more I feel like I could have done but didn't because of the injuries." Jacobs played in all 15 games last season but couldn't match the feat this year due to a hamstring injury that kept him out of the first two games, against Florida State and Fresno State. 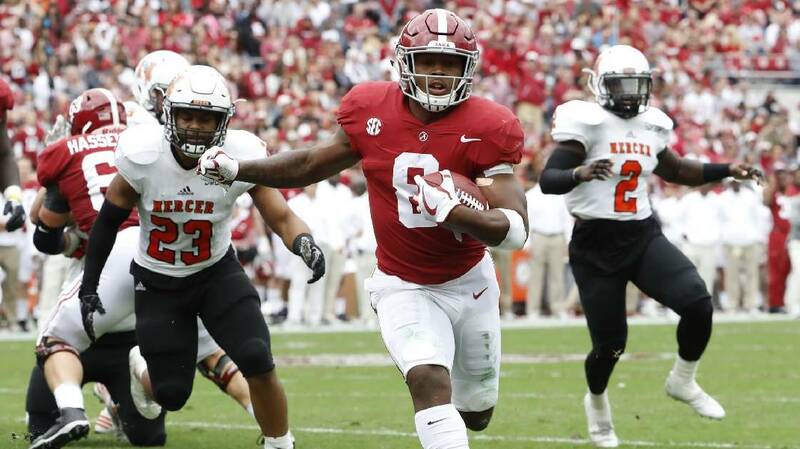 His playing time was limited by the junior duo of Damien Harris and Bo Scarbrough, but Jacobs delivered at a very key moment for the Crimson Tide. Trailing Mississippi State 24-17 early in the fourth quarter amid a hostile atmosphere at Davis Wade Stadium on Nov. 11, Alabama began a drive at its 18-yard line with a 7-yard run by Jacobs, an 8-yard scramble by quarterback Jalen Hurts and a 13-yard run by Jacobs. That possession wound up covering 82 yards and 10 plays, with the Tide pulling even on a 14-yard run by Harris before going on to win 31-24. "Josh is a different sort of cat for us, being a quick, explosive, fast guy," Alabama coach Nick Saban said after that comeback. "He has not been healthy all the time, but I think as a change of pace to go in there to do what he did tonight was probably the whole spark for the whole team. His competitive disposition in terms of how he ran the ball and his second effort, I think, affected everyone out there." Jacobs had a 45-yard run against Ole Miss, a 33-yard reception against Arkansas, a 22-yard carry against Tennessee and 13-yard runs against Vanderbilt and Mississippi State, so there were productive moments. He also has 12 receptions for 165 yards (13.8 yards per catch) and two touchdowns, with his receiving yardage tops among the Tide tailbacks. "I just kind of try and do whatever they ask me to do and whatever they feel I'm capable of doing for the offense," Jacobs said. Alabama has possessed one of the deepest crops of running backs in Southeastern Conference history with Harris, Scarbrough, Jacobs and the freshman tandem of Najee Harris and Brian Robinson Jr. It's been an effective bunch as well, with all five averaging more than 5.0 yards per carry. Harris and Scarbrough could decide to forgo their senior seasons for the NFL, with draft analyst Todd McShay recently telling ESPN each would be picked sooner than later. "It's a very deep draft at that position," McShay said. "(Penn State's Saquon) Barkley is No. 1, but LSU's Derrius Guice, Stanford's Bryce Love and the Alabama duo of Bo Scarbrough and Damien Harris are really good, too. I have nine backs with grades that would put them in the first three rounds." For now, however, it's a matter of bouncing back from a 26-14 loss at Auburn on Nov. 25. Harris, Scarbrough and Jacobs each had just six carries against the Tigers, even though their 18 combined rushes netted 122 yards. "It's always a big thing when you can establish a run game," Jacobs said. "That's what we need to try to do." On Wednesday, Alabama received its 13th and 14th commitments for its 2018 signing class, with the nonbinding pledges coming from cornerback Saivion Smith of Mississippi Gulf Coast Community College and tight end Michael Parker of Huntsville. The 6-1, 175-pound Smith is a former five-star LSU signee, and he is ranked by 247Sports.com as the No. 4 junior college prospect nationally. The 6-6, 230-pound Parker is from Westminster Christian Academy and is rated a three-star prospect by 247Sports.com. Alabama got off to a slow start in this recruiting cycle but is now No. 10 in the 247Sports rankings and third in the SEC behind Georgia (No. 4) and Auburn (No. 8).